Despite its recent stumbles, the dollar has had the hot hand for much of the last two years. The U.S. Dollar Index, which measures the value of the dollar relative to a basket of foreign developed market currencies, has advanced 18 percent since April 2014. Conventional wisdom suggests that the dollar isn’t done yet. The Federal Reserve is looking for any excuse to raise interest rates, while Europe and Japan are desperately trying to reboot their economies — a recipe for a stronger dollar. You know what you do with your portfolio when the stock market behaves badly? You move to those timeless stores of value: cash, gold and real estate. Or at least that’s what some investment strategists are suggesting in response to market malaise. They certainly aren’t not alone. Just search on Google for advice about the wisdom of investing in cash, gold or real estate and you’ll find a chorus of voices singing the praises of those traditional safe havens. Despite such popularity, my guess is that few sophisticated portfolio managers actually attempt to sidestep the market’s vagaries by hiding in cash, gold or real estate — and for good reason. Consider that the simplest 60/40 diversified portfolio made up of the S&P 500 Index and long-term government bonds has returned 9.9 percent annually from 1972 to 2015 (the longest period for which data is available for all investments referenced in this column; those returns include dividends). Cash, as represented by 30-day Treasuries, returned 4.9 percent annually over the same period. Gold returned 7.5 percent annually over the same period. And real estate, as represented by the FTSE NAREIT U.S. Real Estate Index, returned 9.7 percent annually over the same period. 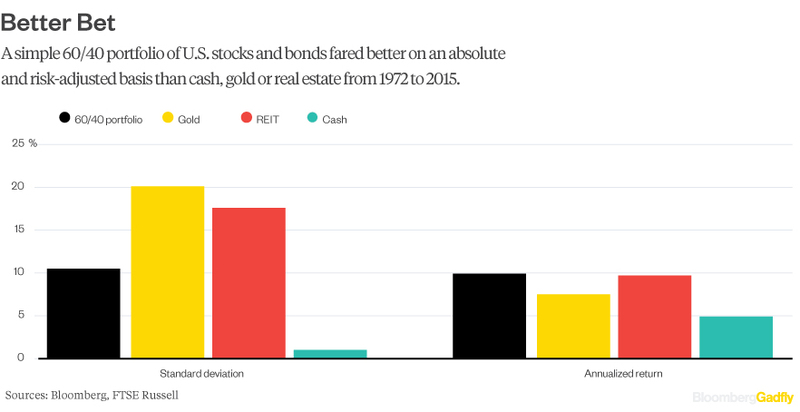 So cash, gold and real estate have been no match for a simple diversified portfolio over the long haul. But here’s the more crucial twist: They also haven’t even been a sure-fire hiding place during market routs. There were four ugly multi-year episodes for U.S. stocks between 1972 and 2015, as measured by changes in the value of the S&P 500. The first episode was the Nifty Fifty crash of the early 1970s. The 60/40 portfolio declined 29.6 percent from December 1972 to September 1974, but real estate investors were less fortunate, suffering a decline of 52.6 percent over the same period. The second episode was the stagflation recession of the early 1980s. The 60/40 portfolio declined 3.7 percent from November 1980 to July 1982, but this time it was gold investors’ turn to get hammered with a decline of 44.7 percent over the same period. The third episode was the post-tech bubble collapse of the early 2000s. The 60/40 portfolio declined 21.2 percent from August 2000 to September 2002, and this time investors got what they came for – cash, gold and real estate all appreciated in value. The fourth and most recent episode, of course, was the 2008 financial crisis. The 60/40 portfolio declined 29.7 percent from October 2007 to February 2009, but real estate investors were left poorer yet again, suffering a decline of 63.2 percent over the same period. Given that cash, gold and real estate appear to be less than perfectly correlated, you may be wondering whether a combination of the three would have been the silver bullet. No dice there either. An equally weighted portfolio of the three would have declined in two of the four bear markets – by 8.5 percent from November 1980 to July 1982, and by 20 percent from October 2007 to February 2009. All of this means that investors who are hell-bent on sidestepping bear markets have a near-impossible mission. For starters, they have to time their market exit and re-entry to near perfection, which is famously difficult to do. But that’s just the beginning. Investors also then have to predict which of their desired ports of call –- cash, gold or real estate –- will actually hold up in a storm. Granted, cash should always hold up (and if it doesn’t, heaven help us all), but it also inflicts the most severe penalty for mistiming the market, as it will fall farthest behind over time. So investors shouldn’t look longingly at cash, gold or real estate right now, even if their portfolios seem shaky. They should just stay the course, because sometimes a port in the storm is much more dangerous than it appears to be. And yet, and yet. The monstrous volatility that has visited global stock markets over the last two decades has given rise to an alternative investing mantra: buy-and-adjust. As my Bloomberg colleague Mohamed El-Erian noted, a more flexible approach to asset allocation may allow investors to exploit volatility by tilting their portfolios to cheaper assets during market selloffs and to higher quality assets during booms. Which begs the question: Has a flexible (tactical) approach to asset allocation — in which an investor opportunistically adds value plays to her portfolio when markets are whipsawing — beaten a static (buy-and-hold) approach to asset allocation? A lot of folks are scratching their heads about the recent high correlation between stocks and oil, and it has inspired some high profile musing. Ben Bernanke posits that both stocks and oil are reacting to slowing global growth. Howard Marks recently told my Bloomberg<GO> colleagues on television that any correlation between stocks and oil is proof that investors simply don’t understand the relationship between the two. But the focus on the recent waltz of stocks and oil misses a larger concern: a multi-decade shift in correlations across risk assets that threatens to crack the foundation of portfolio theory. In the abstract, a high correlation between stocks and oil — and commodities generally — should be the exception, not the rule. Lower commodity prices translate into lower costs and higher earnings for all but commodity producers, and higher earnings translate into higher stock prices. An obvious exception is a slow-growth environment that threatens both commodity prices and sales, but that would be cyclical by definition and any resulting spike in correlation between stocks and commodities should be fleeting. Go ahead, invest 100 percent of everything you have in stocks. Or, even better, please don’t. A recent New York Times column suggesting that investors allocate 100 percent to stocks clearly disagreed with that point of view, using a relatively non-controversial argument: Stocks have a higher expected return than bonds, and the longer your investment period, the greater the probability of capturing that higher return. Ergo, buy stocks, hang on, and collect your prize. The problem, of course, is that investors fail to hang on. You wouldn’t know it by looking at mutual fund returns because those returns ignore the timing of investors’ buy and sell decisions, and assume instead that investors bought and held their fund shares for the entire period. But if you’ve ever looked at a fund’s performance and thought, “That’s not the return I got,” you know that the actual return depends on when you bought and sold the fund. 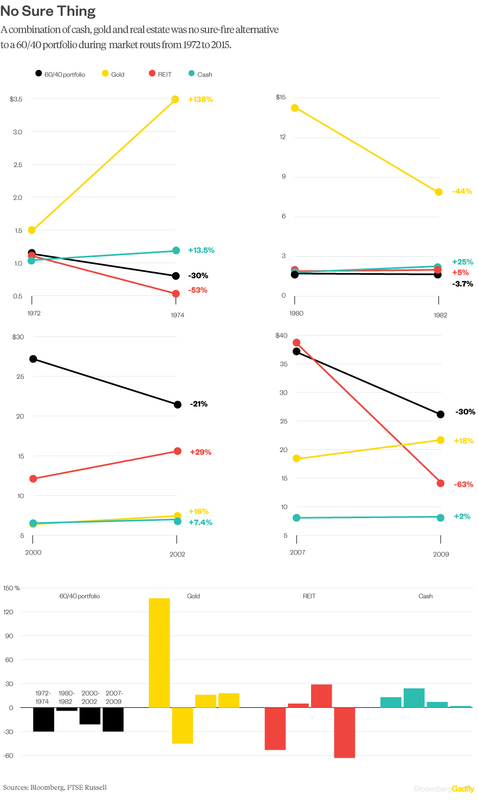 To bridge the gap between a fund’s return and the return investors actually achieved, Morningstar compiles “Investor Return” data for funds, which takes into account the impact of inflows and outflows. I looked at mutual funds in Morningstar’s U.S. large cap category and compared the average fund return with the average Morningstar investor return. Think You Can Time the Market? Watch the market get highly volatile. Then watch some investors, as they always do, start talking about market timing. The Wall Street Journal quoted a Davos attendee last week as saying that “the trade now is to hold as much cash as possible.” In other words, dump everything and move to cash. Last week, Michael Batnick posted on his “The Irrelevant Investor” blog an examination of the impact on investors of missing the 25 worst days in the market annually, or missing the 25 best days — or even missing both sets of days. As Batnick noted, the post was just a thought experiment and he said that he wasn’t “suggesting it’s easy or even possible to achieve” the superior results snared when getting that timing right. Market timing is intuitively appealing. When declining markets bring on the blues, an obvious remedy is to take your money and go home. The problem is that timing your re-entry is famously difficult, and there is considerable evidence that investors chronically mistime markets to their profound detriment. Well, not nothing. Diversification worked. If you were invested in a diversified portfolio in 2015, you didn’t make money, but you were protected from very painful declines in some corners of the global market. The 60/40 diversified portfolio below, for example, was down 1.4 percent in 2015 – a year in which two of its components, emerging market stocks and commodities, were down 14.6 percent and 32.9 percent, respectively. 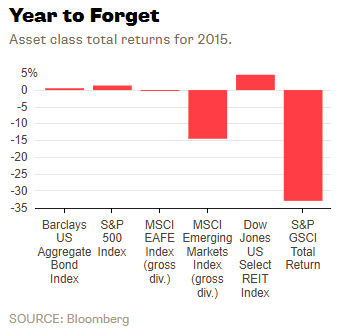 One virtue of diversification is shelter from the storm, and it delivered in 2015. So why fret? For starters, diversified portfolios have barely budged over the last two years. The portfolio above has only returned 2.2 percent annually to investors since 2014. On the other hand, the S&P 500 Index – the most widely followed market barometer by U.S. investors – returned 7.4 percent over the same period. Investors feel left behind. Warren Buffett might have you do otherwise, though: trade your diversified portfolio for an S&P 500 Index fund. Buffett has already declared that 90 percent of the money he leaves to his wife will be invested in Vanguard’s S&P 500 Index fund (with the remaining 10 percent invested in short-term government bonds, presumably for liquidity). Buffett is a well-deserved member of the investment world’s version of Mount Rushmore, but he’s wildly wrong to put almost all of his hard-earned eggs in the S&P 500 basket. I’m not the only one who thinks so. I’m not aware of a single portfolio built almost entirely on the S&P 500 – not Yale’s, not CalPERS’s, not the hallowed private wealth portfolios of Goldman Sachs, not the portfolios of your friendly local financial planner. 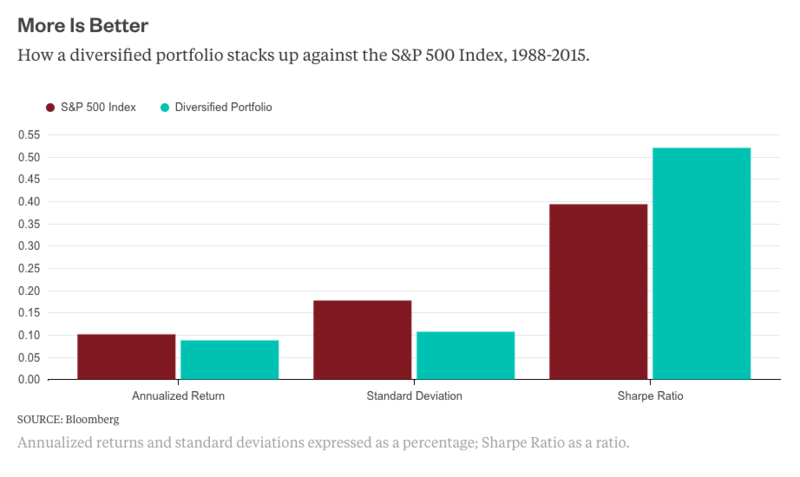 Note, obviously, that the S&P 500 was both more volatile and less rewarding than the diversified, 60/40 portfolio. A hundred years ago diversification meant assembling a portfolio of individual U.S. large cap stocks and bonds. 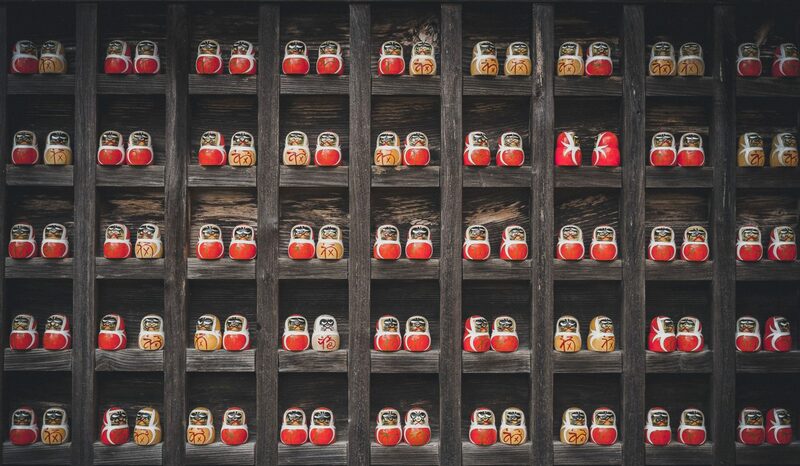 Today diversification means assembling a portfolio of asset classes that stretch across geography (U.S., international, emerging, frontier), size and quality (large cap, small cap, investment grade, high yield), and the capital structure (bonds, mezzanine debt, preferred stock, common stock). As the number of asset classes proliferate, so do the number of strategies that attempt to assemble them into a coherent portfolio. They go by names such as Markowitz (after Nobel Laureate Harry Markowitz, who introduced mean-variance optimization in the 1950s), Strategic-Tactical, Global Tactical Asset Allocation, Black-Litterman, Global Macro, and Risk Parity. There also are newer, unnamed strategies, such as those that allocate on the basis of valuation or momentum — or both. Multi-asset portfolios are commonplace today, but they generally rely on a single strategy. Just as a multi-asset portfolio is more efficient than a single-asset portfolio, it stands to reason that a multi-strategy portfolio would be more efficient than a single-strategy portfolio. The reason is simple: When one strategy isn’t working, the others may pick up the slack. Rather than revert to a single asset such as the S&P 500, my guess is that in the not distant future, portfolios will become multi-strategy rather than merely multi-asset. These multi-strategy portfolios will be a step forward, but no silver bullet. There will still be years when nothing works. There will still be periods when the S&P 500 is the best performer. In those periods the challenge will still be not to look at the S&P 500 with envy. And if anyone tells you that nothing worked in the markets last year, tell them that you know of one thing that did: diversification.